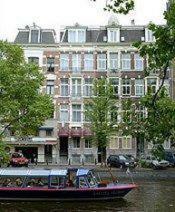 Hem Hotel Maas, Amsterdam discount hotels and accommodation. A charming three star hotel, situated in peaceful surroundings at one of the canals of Amsterdam. With rooms that will make even your night in Amsterdam into an unforgettable experience. You can choose from rooms with or without a comfortable waterbed, whirlpool or romantic view of the canal. Easily accessible by lift, all rooms are provided with shower and toilet, television, telephone, minibar, coffeemachine, hairdryer and when wished for, an ironing board and iron. Do you need your laundry done, your luggage safely stored or a reliable baby sitter to give you peace of mind whilst enjoying Amsterdam? No problem. Need more local currency? The Maas Hotel will gladly change whatever you need at current exchange rate. We also sell parking permits, tram tickets and telephone cards. View photos, room descriptions and make online reservations at Hem Hotel Maas. Save on room prices at Hem Hotel Maas, Amsterdam.